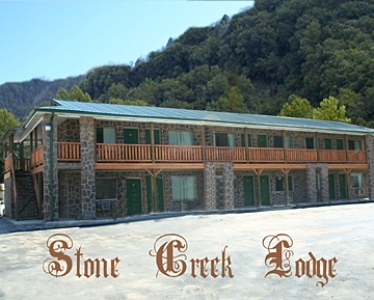 The Stone Creek Lodge has 31 rooms. We are located next to the Guyandotte River with a Rustic look. We have 3 types of room sizes, we have a Triple with 3 Queen beds and full size kitchen, Double with 2 Queen beds, and a Single with 1 Queen bed. All rooms have a fridge and microwave. We have free local and long distance calling. We also have free Wi-Fi. We have a carwash and laundry mat on the property. We are within walking distance Razzles Night Club and the Justonian Restaurant. We are located 1/4 mile from the R.D. Bailey lake and a mile in half from the Larry Joe Harless Community enter which offers an indoor pool and exercise facility. The closet trail to us in Rockhouse the Gilbert Connector. You can ride your ATV from the motel to the trail connector. Come stay with us, we would love to meet you and your family.